Veja a Itália ao volante de um retro Fiat 500 nesta excursão de 4 horas pela Toscana. Dê uma volta pelo campo, desfrutando de vistas panorâmicas de Florença e uma parada na Igreja de San Miniato al Monte. Seu guia guiará o caminho para um terraço privado, onde você desfrutará de um delicioso almoço toscano antes de voltar ao seu ponto de partida original em Florença. 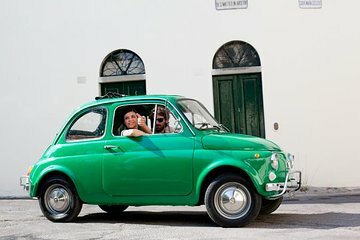 O Fiat 500 foi introduzido pela primeira vez na Itália na década de 1950 e rapidamente conquistou os corações dos italianos por sua aparência elegante e preços acessíveis. Hoje em dia, modelos vintage são mais difíceis de encontrar, mas você terá a rara chance de montar uma modelo dos anos 1960 em sua turnê. Junte-se ao seu guia no centro de Florença e dirija-se à garagem onde seu carro retrô estará esperando por você. Uma visão geral de segurança será fornecida, bem como um teste com as marchas manuais do carro para garantir que você esteja confortável antes de pegar a estrada. Então você está fora! Seu guia manterá contato constante de rádio à medida que você seguir pelas ruas da cidade até as colinas da Toscana. Pare para ver o belo design românico da Igreja de San Miniato al Monte, conhecida por muitos como a igreja mais bonita do país, e aproveite as vistas circundantes de Florença abaixo. Volte para o seu Fiat e caminhe mais fundo pela Toscana, parando para fotos e passando por cidades encantadoras nas colinas. Seu guia guiará o caminho para um terraço privado, onde você e seu grupo apreciarão uma refeição tradicional da Toscana, completa com especialidades regionais, como crostini e salame curado. Depois que seu estômago e suas papilas gustativas estiverem saciadas, você voltará ao seu ponto de partida original em Florença. Por favor, observe que os Fiat 500 são pequenos se comparados à maioria dos carros atuais, portanto, com o conforto em mente, as reservas só são aceitas para no máximo três adultos ou dois adultos e duas crianças, por carro. Se o seu grupo for maior, não se preocupe - até 15 pessoas podem reservar, e cada grupo será dividido em carros separados, viajando juntos em um comboio colorido. We love old cars and the Fiat 500 is an all-time favourite, so what other way is there to putter about the hills of Tuscany? We were greeted warmly at the premises, given helpful instructions about how to drive our little car, plus a walkie-talkie, and we were off, in convoy with some wobbly fellow adventurers on Vespas. The route minimised the Italian traffic madness and we travelled at an appropriately relaxed pace, winding through gorgeous villages and over equally gorgeous hills. Lunch in an also gorgeous restaurant was a simple but suitably regional two courses of pasta, antipast and wine. Fabulous!If I can find a criticism, the one thing missing was commentary. A Trabant tour of Berlin we did included commentary from our convoy leader (over a radio), which helped us prepare for turns and stops, and included info about the sights along the way. But that wouldn't necessarily be appealing to everyone.Our car performed faultlessly, although I suspect that our Vespa riders slowed us down a little.All in all a fabulous combination of motoring fun and tourist delights. Stefano was our tour guide and we had several Vespas and 3 Fiats not including Stefano leading the charge. By the time we got to the first scenic outlook, we were reduced to 2 Fiats me driving by myself and a couple behind in from Boston. Unfortunately one car had to consolidate into the guide car due to issues driving manual/standard. These are cars from the 60s and 70s, you need to know how to use a clutch. The cars are so well maintained and the clutch was like butter. I had a grin on my face the entire time as we blatted around Florence and the country side. I was waving like I was royalty at pedestrians and tourists alike. I found the drive and streets chosen to be relatively simple I do live and drive in LA and our guide Stefano was very good about making choices so the whole group could make it OR he may have blocked traffic for one of our turns so we could all make it together. There are walkies to keep you in touch should you get lost no one got lost. I had an absolute ball driving around and taking photos I drive the newer Fiat 500s!. Lunch was delicious. There was another group making pasta so we spied on them for a little while. All in all it was a wonderful way to round up my stay in Florence and definitely the highlight of my trip. If you like driving around a foreign country, like vintage Fiats and want a nice rustic lunch with a beautiful view, this 4ish hour tour is perfect for you! This was one of the best highlights of our trip. It was so much fun! The tour guide Alessandro was awesome and we got to see so much in four hours. Before our meal, we stopped just outside of the city where we overlooked the entire city of Florence amazing views!. 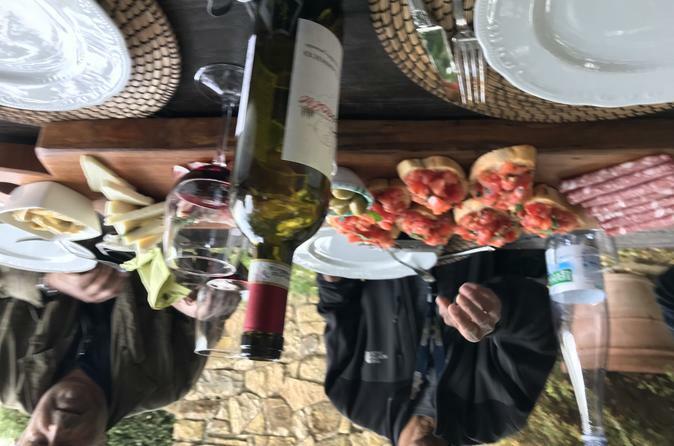 We then stopped at a vineyard and ended our tour with an amazing tuscan meal. The Fiat was so much fun to ride in and highly recommend this tour to anyone. You will have an unforgettable experience. A true Italian experience. This was one of the highlights of our trip to Florence!! Let's be honest, I booked this for the picture opportunity but we had a great time! First, the directions to get to the garage were very easy to follow. This wouldn't seem like a big deal, but after a horrible interaction with another tour group you realize explicit directions really help! My husband was driving and getting out of the city was a bit hectic, as you can expect, but once we were out in the country side he had a great time! We had so much fun driving and we loved it when others would take pictures of our fleet of Fiats as we drove past! As old cars are wont to do, the car had some issues getting started but nothing that our tour guide Alan couldn't handle. The stop for food at the companies villa was lovely. The food was nothing special but the view was spectacular! We would highly recommend this tour! This tour was amazing! Our guide, Angelo, was phenomenal. We saw areas of Tuscany we would never have seen on our own. The food was wonderful also! Would highly recommend! This was our very favorite experience of our whole 2 week trip in Spain and Italy. We cannot say enough about it. If you are not a strong driver with manual then don't do it though! Beautiful countryside even in the rains. This was the highlight of our time in Florence. The cars and the driving was exciting but we were most amazed by the fantastic lunch! What a treat to eat al fresco with that amazing view. Highly recommend!! This was awesome and if you drive manual transmission I strongly suggest you give this tour a go. Excellent tour guide!!!! Great way to get use to driving and parking in Florence. Best tour we took in Italy! Our guide was knowledgeable, patient, fun and his English was fantastic! The cars are authentic and fun! The views were postcard picturesque. We made many stops and were able to get a feel for the real Italy. The stop for lunch was very special. The guide was concerned and compliant with dietary requirements and restrictions. The food was the best we had in Florence. The tour size was small and personal. We followed the guide in a Fiat and 3 Vespas followed us. This was worth every dollar we spent. First rate company and employees.